The biggest Dutch trade union FNV has come out in favour of a transition period for expats who will be hit when the government cuts the time limit for the 30% ruling to five years next January. Despite campaigning to have the 30% ruling abolished altogether, the union says the government should protect current beneficiaries. Scrapping the system altogether will save millions of euros which could be better spend on education or healthcare, the FNV said in a press release. However, there should be a ‘decent transition agreement, respecting the rights of current beneficiaries,’ deputy chairman Tuur Elsinga said in a letter to tax minister Menno Snel. Parliament’s finance committee is meeting behind closed doors on Thursday afternoon to discuss the government’s plans to reduce the ruling to five years from next January for both new and current beneficiaries. DutchNews.nl has contacted the finance spokesman of all 13 parties represented in parliament asking for their position on the government’s plans. A spokeswoman for the pro-animal PvdD told DutchNews.nl that the party backs abolishing the 30% agreement altogether but does support some form of transition agreement for current beneficiaries. Socialist MP Renske Leijten told DutchNews.nl that winding down a tax break can only be justified if it will not cause a large group of people financial problems. A spokesman for VVD MP Helma Lodders said the party understands the concerns people have about the plans to change the 30% ruling. ‘That is why we will carefully study all the input we have had and will use it in preparing for debates in the coming months,’ the spokesman said in an emailed statement. The three other coalition parties did not respond to requests for comment. On Tuesday, the United Expats organisation and representatives of some 30 companies, including Aegon, Heineken, TomTom and Philips, met members of the finance committee to express their concerns about the plans. 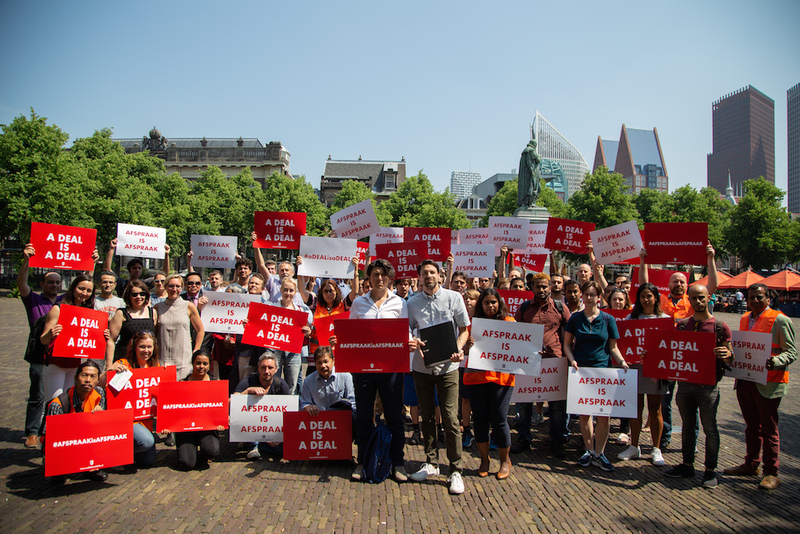 The American Chamber of Commerce in the Netherlands and the Dutch German chamber of trade have also thrown their weight behind the campaign. ‘A government that levies heavy additional taxes on temporary employees who add great value to the Dutch economy… damages the reputation of the Netherlands as a preferred destination for international businesses,’ the two organisations said in a joint letter to tax minister Menno Snel. Over 30,000 people have signed a petition calling for a rethink and campaigners have raised over €10,000 through crowdfunding to pay legal fees if the issue comes to court. Research by the International Community Advisory Panel shows the plan will lead to a brain drain, damage the reputation of the Netherlands abroad and have a major financial impact on thousands of expats. Some 54% said they had less trust in the government and 75% said they were told about the ruling by their employer.